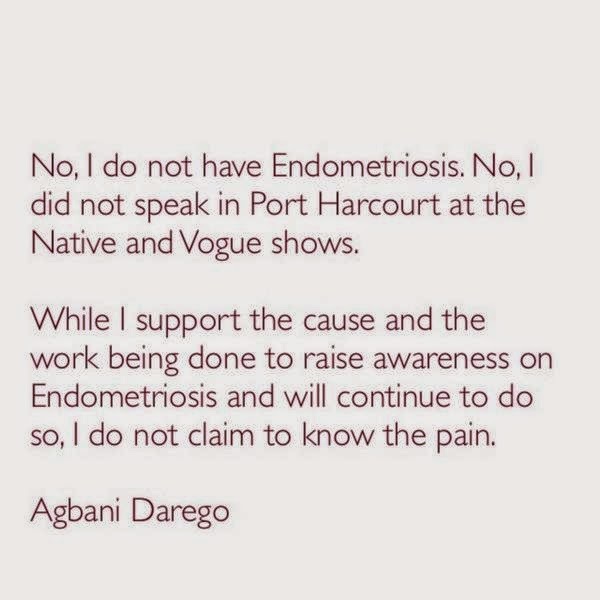 This past Sunday, ThisDay newspaper featured a story “revealing” Agbani Darego‘s endometriosis struggle. The article claimed the Nigerian beauty queen turned fashion entrepreneur disclosed details of her endometriosis struggle during the recent Native & Vogue Fashion Week in Port Harcourt. The article claimed that an emotional Agbani got on stage and talked about her multiple surgeries, losing her fallopian tubes and one ovary. In reality, it was a case of mistaken identity as it was Tanzanian model Millen Magese who told her story and for some reason, the reporter mistook Millen for Agbani. We hear that as soon as the article was published, Agbani began to receive comments and emails from concerned fans. She has now taken to her twitter page to clear the air.